Super filling, I couldn’t even finish my portion! DJ also loved them! A take off of the deep fried version of taquitos. One serving works out to be 350 calories, 40 carbs, 11g fat, 16g calcium, 16g protein and 1247 sodium. At less than $2 a serving, less than 30 minutes from beginning to end and less than 350 calories…this is a favorite of mine!! 1. Heat oil in a large non-stick skillet over medium high heat. Add onion and green pepper and cook for 3 minutes, stirring occasionally. Add bacon and cook for another minute, stirring occasionally. Stir in beans, salsa and chili powder. Cook for another 3 minutes, stirring occasionally. 2. Spray a large non-stick skillet with cooking spray and place over medium high heat. Prepare one tortilla by spreading 1/5 of the bean mixture over tortilla, about 1/3 cup of the cheese and sprinkle some of the cilantro on top. Place in skillet and cover with another tortilla. Cook for about one minute, press with spatula to secure ingredients and flip. Cook for about another minute until browned. 3. Place quesadilla on baking sheet and keep warm in a 200F oven (or just start feeding the kids, that’s what I do!!). Repeat with the remaining ingredients to make 4 additional quesadillas. Allow skillet to cool if it becomes too heated. Spay with cooking spray between each quesadilla. 4. 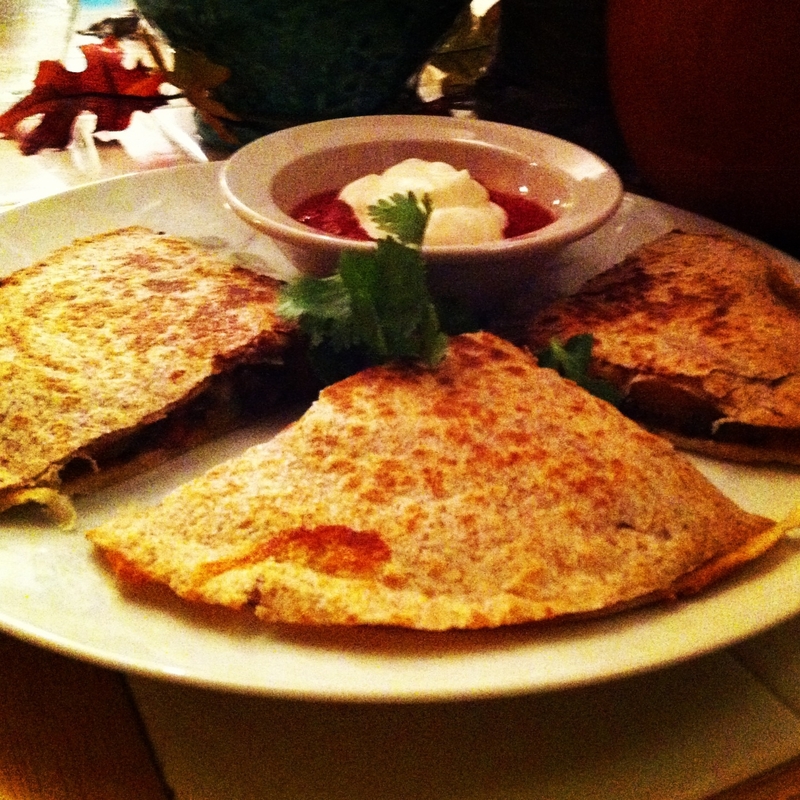 To serve, cut each quesadilla into quarters. Serve 3 quarters and pass with additional sour cream and salsa.